This type of contour pillow is made for people with smaller frames who sleep in either the supine lying position or the lateral position. It helps prevent any strain on spinal curvatures. This type of contour pillow is made for medium or large-framed people who are typically side-sleepers. It provides a healthy and comfortable sleeping position for people sleeping on their sides. While it's good to know that there are different types of contour pillows for different sorts of sleepers, it should be noted that buying any type of contour pillow is not a wise choice for side sleepers. It can be uncomfortable and sometimes, even harmful to choose a run-of-the-mill contour pillow if you are a side sleeper experiencing body pains. If you are looking to find the best contour pillow for side sleepers, there are different pillows available on the market – you just need to do a bit of research. Which is why we're here! From our research, we've found that Comfort & Relax Ventilated Memory Foam Contour Pillow is the best bet for ultimate comfort and support for stomach, back and side sleepers – and we're about to tell you why. What is Comfort & Relax Ventilated Memory Foam Contour Pillow and What Makes It Unique? Comfort & Relax Ventilated Memory Foam Contour Pillow is a high-quality side sleeper pillow that includes ventilated gel memory foam and a washable cover. Precise contour design which helps relax and eliminate any neck, back or shoulder pain, commonly experienced by side sleepers. Gel memory foam material, which is, according to the manufacturer, the highest in quality and very responsive to your movements. Ventilation holes within the memory foam which allow for airflow, providing a cool and enjoyable sleeping experience. Memory foam pillows which don't include ventilation holes tend to get overheated. The gel memory foam is CertiPUR-US certified meaning it does not contain toxic ingredients such as formaldehyde, PBDE or methane chloride. It also offers a protective agent against mold, bacteria or dust mites, making it hypoallergenic. This provides a very unique and important safety and health aspect to this product. Along with these features, this pillow is extremely comfortable to sleep on. The higher side of the pillow is designed to allow you to turn over onto your side while providing support and comfort. The Comfort & Relax Ventilated Memory Foam Contour Pillow comes in a standard patent design that measures 24" x 16" x 4.7"/3.5". However, the level of loft varies from person to person, depending on your body size and sleeping preference. You can choose between high loft, medium loft or low loft. To figure out which loft best fits you, check out the chart provided here. No matter which size of loft you decide on, the price for this pillow is the same. It can be found on Amazon for a very reasonable $24.99. This includes free shipping if you have Amazon Prime. If not, regular shipping charges apply, depending on which shipping method and destination you choose. Alternatively, you can find the Comfort & Relax Ventilated Memory Foam Contour Pillow at the main site of Comfort & Relax for $39.99, not including estimated shipping and taxes. Keep your eye out on Amazon for sales on this product! The Comfort & Relax Ventilated Memory Foam Contour Pillow overall is a simple, yet effective contour pillow for side sleepers. 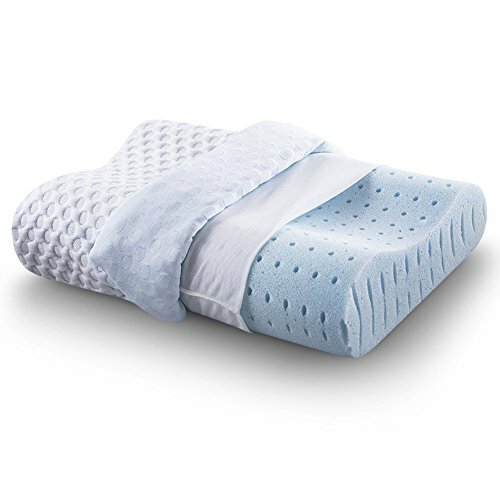 While there are a lot of pillow brands on the market offering elaborate features and creative ways of providing sleep support, Comfort & Relax Ventilated Memory Foam Contour Pillow does its job, without extra bells and whistles. Just by looking at public reviews, it's clear to see that this statement is true. Out of 301 reviews on Amazon, 66% of customers gave Comfort & Relax Ventilated Memory Foam Contour Pillow a 5-star rating. Most customers rave about the quality sleep they receive from this pillow, which is from its support and comfort. Others who have been experiencing neck or back pain have found extreme relief after sleeping on the Comfort & Relax Ventilated Memory Foam Contour Pillow. The shipping time is also a big plus with this pillow as it's proven to have a speedy and efficient delivery process. Also, Comfort & Relax Ventilated Memory Foam Contour Pillow's size tends to be another bonus for customers as it provides more support and comfort – especially for sleepers who tend to toss and turn at night. Another mentionable is this pillow's ability to keep you cool at night. This is a big plus for people who tend to get overheated. It's also a refreshing change from usual memory foam pillows. However, that being said, there are some pit falls with this pillow, depending on your preference. The main complaint with this pillow is that it's not firm enough – which means support for a lot of people. Others have noted that it's not firm enough. Depending on your preference and specific support needs, you should check out the reviews. Most are posted on Amazon as seen above, which provide an unbiased and helpful direction towards the right choice for you. Also, if you are experiencing bodily pain from your sleeping position, ask your doctor which firmness of pillow is best for you. While there are a lot of amazing contour pillows on the market, there are only a few that are beneficial for side-sleepers specifically. Comfort & Relax Ventilated Memory Foam Contour Pillow is a high-quality pillow, however, there are other pillows that offer different memory foam material if gel foam isn't your gig. Aeris Contour Pillow is Comfort & Relax Ventilated Memory Foam Contour Pillow's biggest competitor. It uses a high-quality memory foam as opposed to the gel memory foam that Aeris Contour uses, however, offers very similar features that makes Comfort & Relax Ventilated Memory Foam Contour Pillow awesome. The advantage of Aeris Contour Pillow is its high rating on Amazon and simple, yet effective model. That being said, despite its free 7-day aeration process, Aeris Contour Pillow the Aeris Contour Pillow isn't CertiPUR-US Certified which means it's composed of VOC's (volatile organic compounds). It also doesn't provide the additional bonus of being hypoallergenic. On top of that, it's also more expensive, at on Amazon. We think it's fair to say there's no real competition once you look at these stats! Comfort & Relax Ventilate Memory Foam Pillow for the win. This is a GREAT pillow for side-sleepers, people who are experiencing neck and back pains, allergies, or people who become over-heated at night. The contour "wave" shape helps align the neck and spine to stabilize the body while providing comfort for side-sleepers and back-sleepers. The ventilated gel memory foam forms to your body while providing a cool and comfortable sleep – sweat-free. Also, the CertiPUR-US certification makes buying this pillow a no-brainer. People are becoming more aware of the harmful effects of VOCs on the human body and the environment. In order to keep a pillow for a significant amount of time, it should be made from proper materials that provide a healthy environment and that can fend off dust mites or other bacteria from taking over. On top of that, the price is right. This pillow is extremely cheap, given its high ratings and impressive certification. It's safe to say that this pillow gets a 5-star rating from us. Although there are negative reviews, as there are with nearly every product, these reviews were based on either preference or a few cases where there were shipping or manufacturing mishaps. Overall, people love this pillow for its ability to ease body pains and provide comfort for a deep sleep. Your neck and back issues will merely become a distant bad dream after spending a night on Comfort & Relax's best contour pillow!